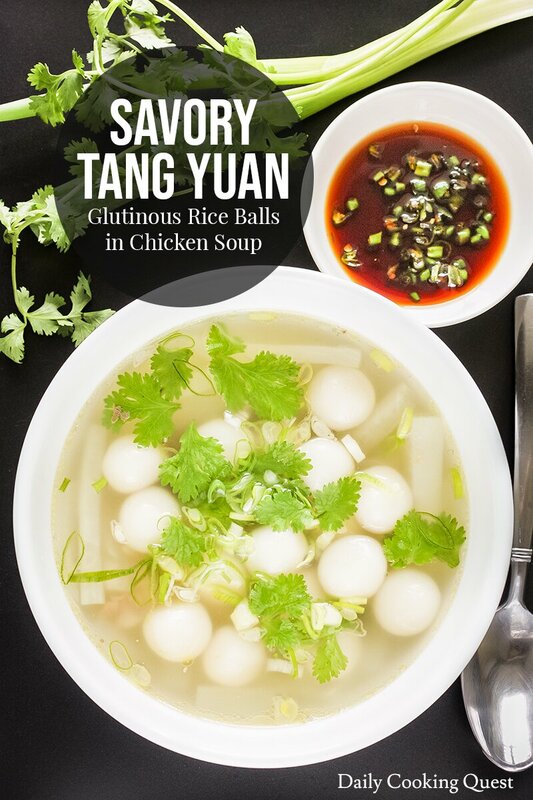 Celebrate winter solstice by making this easy and delicious Cantonese style savory tang yuan (glutinous rice balls) in chicken soup at home. To prepare for tang yuan, you will need some glutinous rice flour. Combine the flour with just enough water until the dough has a consistency of play dough. If you have never played with play dough before, don’t worry, you can always compare with your ear lobe. Once the dough has the proper texture, you can start rolling them into balls with your hand. Place the balls on a dampened towel cloth. If you are making a big batch, you will want to cover the balls with another dampened towel cloth since they do tend to dry up. If you don’t plan to cook the tang yuan right away, you can arrange them on a baking sheet (no touching between the balls), and place in the freezer until frozen. Once they are frozen, you can store the whole lot in a freezer bag. When you want to cook them, simply drop in boiling water in their frozen state. Cooking tang yuan is very easy. Just boil water in a pot, then drop tang yuan into the boiling water and cook until they float, usually around 5 minutes (and longer for frozen tang yuan). Once they have floated for 1 minute, scoop them up and place in a bowl of cold water (this will keep them springy). If they are to be consumed immediately, just drop them into the soup. Place all ingredients in a pot and bring to a boil. 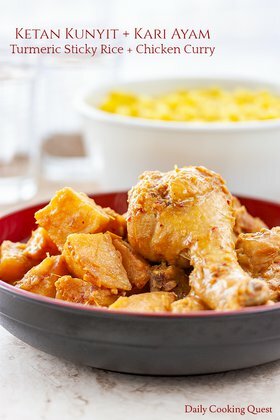 Reduce heat and simmer for 45 minutes to 1 hour until chicken and daikon are cooked and tender. Turn off heat and divide into four serving bowls. Place glutinous rice flour in a mixing bowl. Pour water in batches and knead with your hands until the dough come together into a play dough like consistency. Divide the dough into 40 portions. Gently roll each portion into a round ball. You may want to cover the rice balls with a dampen towel to prevent them from drying. Bring a pot of water to boil. Gently drop the rice balls into the boiling water and cook until they float to the surface. Once they float for about 1 minute, remove with a slotted spoon and place 10 rice balls into each of the bowl of chicken soup. Serve immediately with the garnish and chili sauce. What a great idea! I confess I was a bit disappointed that the little dumplings didn't have any filling. I was imagining something with chopped peanuts and perhaps some preserved radish. Thank you for a great recipe. 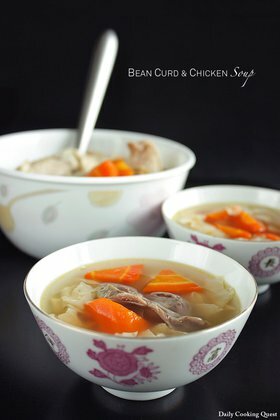 My parent makes this pork or chicken soup with turnips and mushroom napa cabbage and tong yuan. My parents makes this savory Tong Yuan with napa cabbage , mushroom with chicken soup . 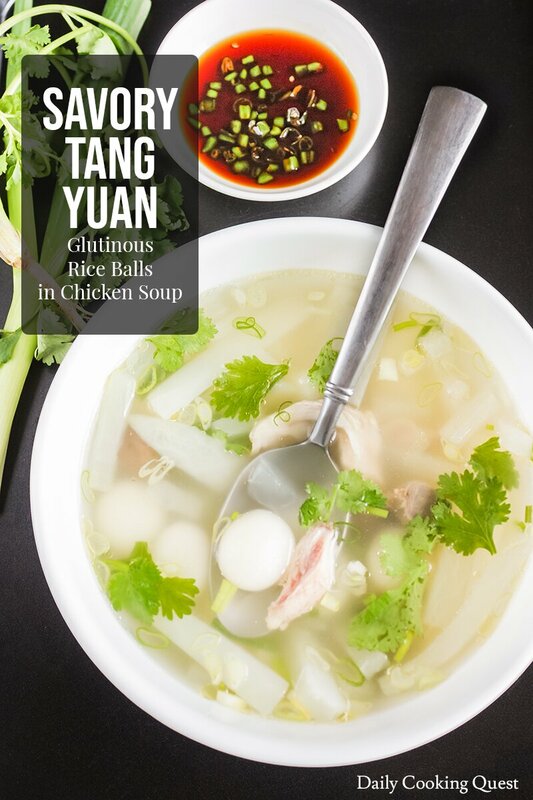 Do you have the sweet Tong Yuan recipe? Do you use sweet rice flour for the Tong Yuan? 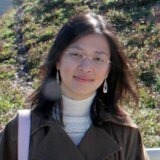 Hi Suzanne, I have several sweet versions: - <a href="https://dailycookingquest.com/wedang-ronde-glutinous-rice-balls-in-ginger-syrup.html">wedang ronde</a> - <a href="https://dailycookingquest.com/wedang-ronde-pandan-pandan-glutinous-rice-balls-in-ginger-syrup.html">wedang ronde pandan</a> - <a href="https://dailycookingquest.com/kabocha-tang-yuan-and-sago-in-pandan-coconut-milk.html">kabocha tang yuan and sago in pandan coconut milk</a> I use glutinous rice flour (sticky rice flour) for my tang yuan. I think it should be the same as sweet rice flour. Can I roll the huan the night before and cook the next day? Hi Rita, sure. They can even be frozen if you wish.